Fenna Martin and Sophie Coxon are two ordinary young people who feel driven to make a positive difference in the world, and to show other young people how living adventurously, in the spirit of Compassionate Action, can transform their own lives and the wider world. Fenna and Sophie helped make Cornwall the world’s first Compassionate County and, as part of Hope in the Heart, have developed links with Botswana, the world’s first Compassionate Country. YOMAD! Has come about through these links, as a means of inspiring young people of all cultures and nationalities to unite in compassionate action to Make A Difference to themselves, and the world they are inheriting. Fenna, Sophie and Tam will initially travel to Cape Town, where they will train to be facilitators of The Virtues Project (a UN-endorsed Character Education Programme that is used in over 100 countries worldwide, but not much in the UK – yet! www.virtuesproject.com). They will then move on to neighbouring Botswana, where the virtues are being widely used in many contexts. In both places they will work with fellow partners of Charter for Compassion International, sharing good practice from the UK and learning how compassionate action is addressing the serious challenges that exist in African communities, and how these lessons can be translated to offer solutions to problems back home. Tam will guide Fenna and Sophie as they co-facilitate workshops on the theme “Images of Hope, Words of Compassion” in which Compassionate Cape Town and Compassionate Botswana’s community members will create personal images of hope, and poems and prose about compassion. 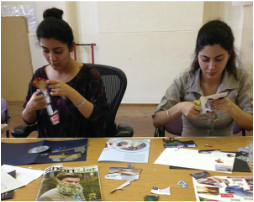 Similar workshops will have been taking place across Cornwall and elsewhere in the UK during the months leading up to this trip, and simultaneously in Botswana, facilitated by Charter Partner Organisation Art of the Soul (http://botho.co/our-staff/art-of-the-soul/). Later in the year the resulting images and words from Cornwall and Botswana will be combined, shared and simultaneously exhibited in Gaborone (Botswana’s capital) and Cornwall, illustrating the common bonds between two very different cultures, and the potential for further diverse partnerships within the compassion movement. They will also be featured in a printed and web-based anthology, and ultimately used as a resource to ignite sparks of hope and compassion in those who view them. We are currently in discussion with the US organisers of Charter for Compassion International about replicating this project internationally following the success of this first phase (see testimonials, bottom of page). On return from Botswana, Fenna and Sophie will work with Hope in the Heart facilitators to run YOMAD! workshops in schools, youth and community groups in Cornwall and elsewhere in the UK. The workshops, incorporating a film they will have made in Botswana, talking with their young African peers, will raise awareness of how differently young people live in African communities, but also the many things they have in common with young people in the UK. Our aim is that this will inspire empathy and a sense of appreciation and gratitude in the workshop participants, who will be encouraged to make direct contact with their African peers through written correspondence, social media and Skype. As part of these workshops, Fenna and Sophie will use their new qualification to demonstrate how the Virtues contribute to positive change in the lives and communities of their young peers in Africa, and to encourage greater awareness of the potential for good in self and others through this major tool in the Compassion Revolution taking place in Botswana. Cape Town signed the Charter for Compassion as a Compassionate City in 2013, and Botswana became the Charter’s first Compassionate Country that same year. Both still face many challenges and are recognising, through experience, that compassionate action is the most effective way to tackle them. "Tremendously inspiring, friendly, happy, life-enhancing, creative, educational ... I gained a huge sense of increased well-being, joy, hope and happiness at just the completely right time in my journey … Fenna and Sophie gave an excellent heartwarming presentation for Hope in the Heart. I hope their committed contributions will draw funding for their proposed trip to Botswana next year. Please support them and wish them well on their journey as they continue to inspire with such passion." – Lesley Smith, workshop participant and Founder of Swings and Roundabouts Mental Health Support Group. "It is perhaps the most constructive and focused recovery tool I have come across.....this workshop has reminded me of the enormous, profound effect of creativity and self-expression." "We believe that 'Images of Hope, Words of Compassion' is a powerful initiative that will bring about hope and inspire people into compassionate action, fuelling them with creativity and empathy through workshops in Botswana and Cornwall … WIthout reservation we applaud Compassionate Cornwall in leading this project. It is our honor not only to endorse them, but also to offer our services and partners on the ground to realize this noble project." "This is a very special and unique project. The sharing of the workshops will help teachers [and] leaders globally and I forsee these being used by many after this first round. It will be wonderful to have a simultaneous opening of the exhibit in Cornwall and Gaborone on the same day/hour, and we will feature the images and writings on the international Voices Compassionate Education site." "I am so appreciative of what you are proposing and planning here! Culturally, images of compassion in action are far too scarce, yet we know humans model what we see both consciously and subliminally and emotions and behavior then follow. Our brains are awash with images that stimulate corresponding neurons and chemicals that can foster despair instead of hope and easily send us into grief and overwhelm at the state of the world. This leads to despair and inertia. 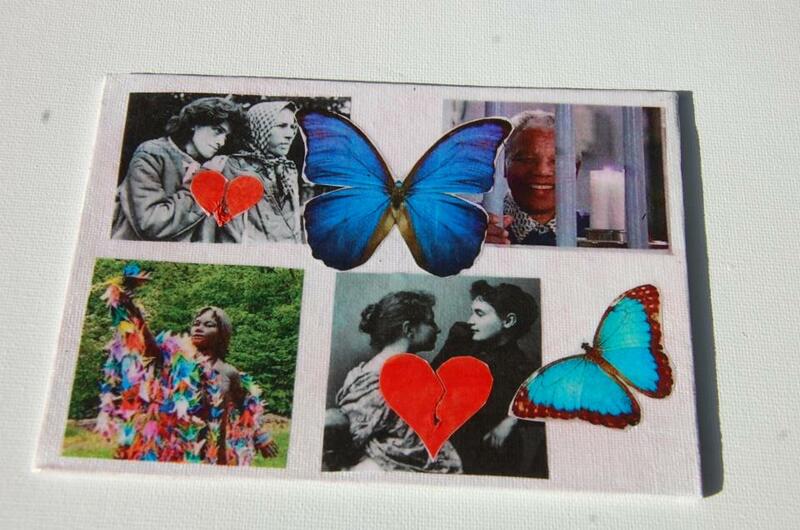 This project intends to produce new images by illustrating active compassion. This promises to fundamentally change the brain, and will condition people to see with their hearts – something the world urgently needs. This project will be life changing not only for the participants but for all those impacted by the positive imaging coming out of this endeavor are the world. This project deserves the highest priority because of its proven leadership and because it is art in service to the world." “…..please share this with Fenna and Sophie directly: what they've done and are doing is incredibly important and powerfully inspires me. Over the last several years I have been working with more and more young people in communities and countries around the world - many of them in areas affected by some of the worst violence in the world (Iraq, Mexico, etc). I am becoming increasingly convinced that there is both a need and an opportunity to mobilise, inspire, encourage and empower young people to take much more active and engaged roles than they are now … today, we need a new movement that can engage people in their millions and hundreds of millions world-wide to make a necessary and major difference in this world.